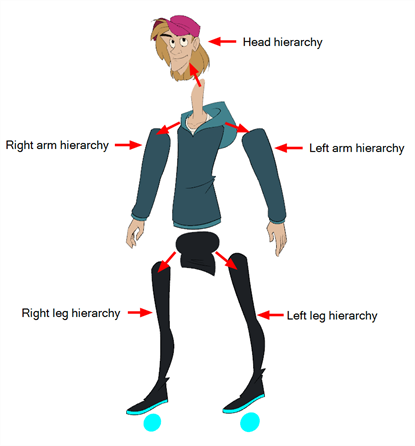 Harmony lets you build your rig in an elaborate hierarchy, allowing you to set which parts of your rig should influence other limbs, and how they can move independently. For example, when rigging a simple character's arm, you can make the forearm layer a child of the arm layer, and the hand layer a child of the forearm layer. This way, if the character moves their forearm, the hand will follow, and if they move their arm, the forearm and hand will follow. In the left area of the Timeline view, select the layer which you want to make a child layer. Drag the child and drop it over the layer which you want to make the parent layer. Make sure you are not dropping the child layer between two layers. 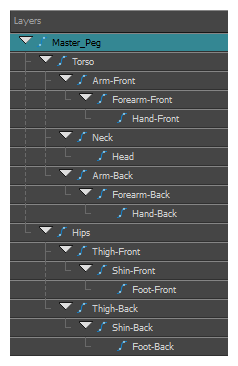 Repeat until you've created a hierarchy that rigs all of your character's parts, with a master peg at the root. While rigging, if you want several layers to have a common parent, but no existing part of your rig can serve as that parent, create a new peg and nest those layers under that peg. NOTEIn the Timeline view, you can unparent layers by holding down Shift, dragging the selected parent away from the child layer and dropping it somewhere else in the list. When rigging, keep in mind that the order of the layers in the Timeline view affects the order in which they are rendered. Layers on top of the list will be rendered over layers at the bottom of the list. Should you need to change a layer's order while animating, you can nudge this layer's position on the Z-axis to override the layer order and force it to appear beneath or over other layers. In the Timeline, Node or Camera view, select the layer you want to nudge. If you selected the layer from the Timeline or Node view, click on the Camera view tab to set the focus on the Camera view. To nudge the layer forward, press Alt + Down Arrow. To nudge the layer backward, press Alt + Up Arrow.